Home CDN , children , crafts , feature , holiday , holidays , homeschool , January , papercrafts , printables , US , worldwide January 4th is - Spirit Rover on Mars Freebies! January 4th is - Spirit Rover on Mars Freebies! -- On June 10, 2003, a little rover named Spirit blasted off on a rocket headed for Mars. 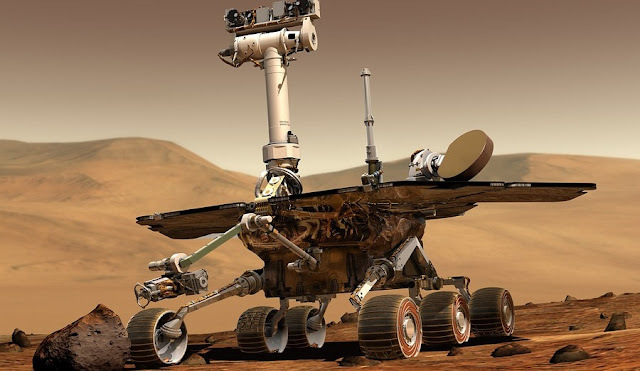 On July 7, 2003, a twin rover named Opportunity soared through the solar system with the same mission: to find out if Mars ever had water which could have supported life. A thrilling addition to the acclaimed Scientists in the Field series, The Mighty Mars Rovers tells the greatest space robot adventure of all time through the eyes—and heart—of Steven Squyres, professor of astronomy at Cornell University and lead scientist on the mission. • NASA Mars Rovers Manual: 1997-2013 -- Is there life on Mars? This age-old question has prompted many missions to Mars, with the most recent rover, Curiosity, having safely landed in August 2012 amid a blaze of publicity. This manual covers the development, design, and engineering of three generations of Mars rover: Sojourner, which landed in 1997, was the size of a microwave; Spirit and Opportunity, both the size of a shopping cart, followed in 2004; and Curiosity is the size of a car, with a design life of two years. • Complete Guide to the Mars Rovers, Spirit and Opportunity -- This incredible set of three DVD-ROMs features an up-to-date, comprehensive guide to the exploration of Mars by the two NASA rovers, Spirit and Opportunity, starting with their landings in early 2004 and continuing with the extended exploration mission through the fall. The rovers made history, finding strong geological evidence for liquid water during the past on the surface of Mars. They also have been transmitting spectacular color images of the surface, with amazing vistas of craters, hillsides, and rock formations. - It's a day to annoy your friends and enemies with all manner of trivia! More and more people are celebrating this holiday each year because so many people all over the world love to play trivia games. As the popularity of this holiday gains strength, we find trivia lovers turn this day into a party day by gathering together; sharing party food and drinks - and enjoying in the fun of playing trivia on Trivia Day. - If you hear the word pasta, you think Italy, but it is said pasta actually goes back to the Etruscans (400 B.C.). It is believed they used to prepare the first lasagna made of spelt which is a cereal like wheat, but far more resistant against bad weather and diseases. - Is there anyone out there who doesn't like flowers? On this day we are encouraged to give a thoughtful and unexpected gift of flowers to someone in our life! - A day when hypnotism professionals promote the truth and benefits of hypnotism to the people of the world while removing the myths and misconceptions. - Thomas Stevens became the first person to complete a bicycle trip around the world in 1887. - President Benjamin Harrison issued a proclamation in 1893, granting full amnesty and pardon to all persons who had since November 1, 1890, abstained from unlawful cohabitation in a polygamous marriage. This was intended in the main for a specific group of elderly Mormons who had continued in the practice of contracting serial marriages. - Louis Braille, the inventor of a widely used touch system of reading and writing for blind people was born at Coupvray, France on January 4, 1809. Permanently blinded at the age of three by a leatherworking awl in his father's saddle-making shop, Braille developed a system of writing using, ironically, an awl-like stylus to punch marks in paper which could be felt and interpreted by people who are blind. The system was largely ignored until after Braille died in poverty, suffering from tuberculosis, at Paris, Jan 6, 1852. - Charles Sherwood Stratton, perhaps the most famous midget in history, was born at Bridgeport, CT on January 4, 1838. He eventually reached a height of three feet, four inches and a weight of 70 pounds. Discovered by P.T. Barnum in 1842, Stratton, as General Tom Thumb, became an internationally known entertainer and performed before Queen Victoria and other heads of state. - On January 4, 1936, Billboard magazine published the first list of bestselling pop records, covering the week ending December 30, 1935. On the list were recordings by the Tommy Dorsey and the Ozzie Nelson orchestras. - Massachusetts businessman James Plimpton's 1863 invention of an improved roller skate led to a boom in popularity in the late 19th century, particularly in cities of the American East Coast. At first, people roller skated at home, but within twenty years businesses dedicated to the activity began to spring up. Plimpton himself is credited with opening the first roller skating rink in New York City. - Born at Woolsthorpe, England on January 4, 1643, Sir Isaac Newton was the chief figure of the scientific revolution of the 17th century, a physicist and mathematician who laid the foundations of calculus, studied the mechanics of planetary motion and discovered the law of gravitation. - The first successful appendectomy was done in Davenport, Iowa on January 4, 1885, by Dr. William West Grant. The patient was Mary Gartside, age 22. - The robotic explorer Spirit woke up to its first full day on Mars, hours after making a perilous landing, sending postcards to Earth and taking a much-deserved snooze. The $400 million NASA craft was the first to land without disaster on the red planet since 1997. It landed successfully on Mars on January 4, 2004, three weeks before its twin, Opportunity, which landed on the other side of the planet.